survives the winter season and is ready to use when the warmer weather comes around again. 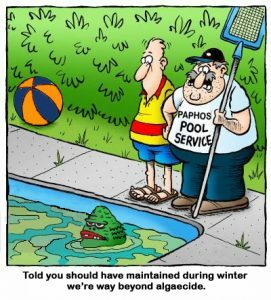 Maispa has some great advice on how to winterize your pool! Step 1: • Balance the water: The pool pH level needs to be between 7.2 and 7.6. Taking a sample of pool water to your local pool store they will tell you exactly what the pH is or you are easily able to test it yourself by using test strips or a test kit. If the level is not correct, add the appropriate treatment to bring the pool to the correct level. Step 2: • Clean the pool! It’s important to brush the walls and floor of the pool and then to vacuum the whole pool thoroughly. Algae thrive in unclean water, so don’t forget to clean the skimmer baskets and the pump baskets of debris. Step 3: • Clean the filter: Ensure that the pool’s filter is sparkling clean, as any grease or oil deposits will harden over winter and make the filter harder to clean in the warmer months, not to mention reducing its overall efficiency. Step 4: • Use a shock treatment: It’s recommended to use a regular shock treatment e.g. (A cup of chlorine granules) throughout winter. Once you’ve added the shock treatment appropriate for your pool, run both the pump and filter for several hours to ensure it has been well distributed throughout the pool. Step 5: • Protect against algae: Use an algaecide that’s appropriate for your pool. Step 6: • Check chlorine levels: To keep your pool clean and clear, it’s important to keep your pool’s free available chlorine levels at a constant level of 2-3 PPM (parts per million) at all times during winter. If you’re using a salt chlorinator and a pool blanket, remember to reduce the output of the chlorinator to 1-2 PPM, as pool blankets trap chemicals and chlorine, and can cause high chlorine levels to occur, resulting in damage to pool equipment if not monitored carefully. Step 7: • Maintain the pH and Total Alkalinity levels: Total Alkalinity (the measure of the ability of your pool or spa water to resist changes in the pH) is the overseer that keeps the pH of your water where it needs to be. If your buffering capabilities are too low (low alkalinity), your pH levels can swing drastically from highs to lows. Step 8: • Cover the pool: This will prevent water loss and also stop debris from entering the pool. Ensure you have a good quality pool blanket or cover. If possible. Step 9: • Keep up your maintenance schedule: Once you’ve completed your preparation for winter, it’s imperative that you stick to a maintenance schedule even though it’s cold and the pool is not being used. Once a week do a quick visual inspection of your pool and make sure all of your equipment is working properly, check the water level, empty the skimmer basket and check your chlorine and pH levels. If in doubt or if you need help, Your local pool shops have technicians available to provide advice and service. This may sound a lot but once you get ahead of the steps, the return will be worth it.